James Wersal, OTD, is a doctoral student in the Rehabilitation Science program at the University of Florida, under the supervision of Dr. Sherrilene Classen. Dr. Wersal earned an entry level Masters of Science degree in Occupational Therapy at Springfield College in 2013. He later pursued and earned a Post-Professional Occupational Therapy Doctorate degree in 2017 with a focus in Administration and Practice Management. Additionally, Dr. Wersal earned his Certified Brain Injury Specialist (CBIS) certification in 2018. He has focused most of his clinical career in neurological rehabilitation, ranging from subacute to community reintegration. 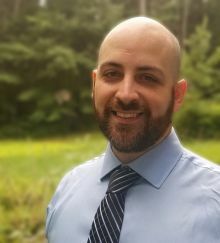 His research interests are integration of technology in treatment and assessment, neurological rehabilitation, complimentary-based treatments such as animal-assisted therapy, and transitional training for veterans. Dr. Wersal is a United States Army Veteran and an active member of the I-MAP lab.